From Petra ...Quite a few Harriers out parkrunning this Saturday. The Schneiders made Skipton parkrun a family affair with David coming first, followed hot on the heels by brother Jonathan in 4th place, and Fiona also running a brilliant time on this hilly (by parkrun standards) course. It is Skipton parkrun's first anniversary next Saturday and it would be great if a few Harriers wanted to join them for the run and a small celebration in the park afterwards. 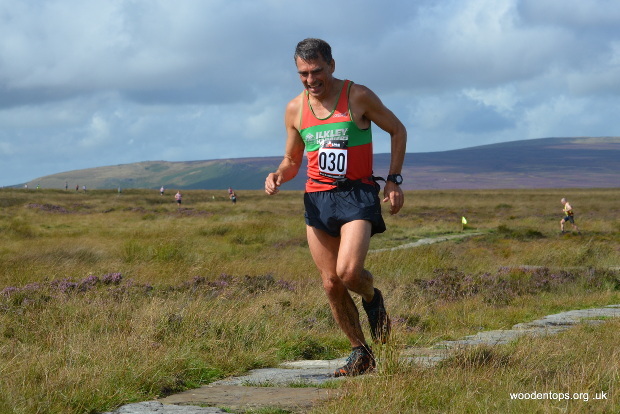 Jamie Hutchinson reports ... a 10k trail run round the moor at Copley near Halifax, starting with a pretty tough first half mile or so of climb. I climbed well with the leaders but fell off the pace as the course levelled off. Great views round the moor as a few of us swapped places, before gradual descent back toward Copley followed by a flat last quarter of a mile. I came in 41:26 and 7th. The race was won by Clive Fitzpatrick in 38:38 and 99 ran. From Jann Smith ... one of the longer fell races this weekend (5m / 457 ft AS) started from Pendleton village at the back of Pendle Hill and took us straight up the back end of Pendle Hill and back down on part of the Full Tour of Pendle race route. 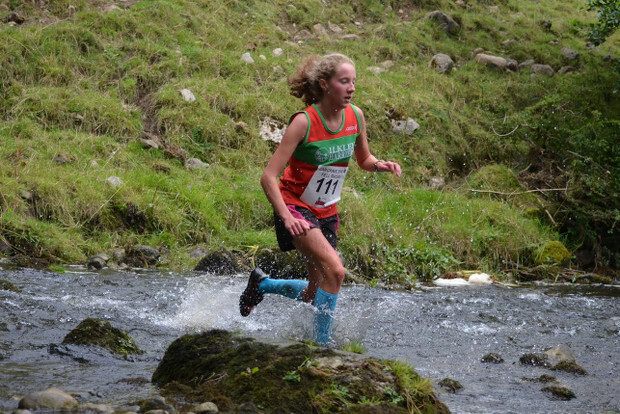 From Petra Bijsterveld ... A number of Harriers were at the Burnsall Feast for the road and fell races, the road race being a counter in the Ilkley Harriers Race League. Whilst driving there I was almost washed off the road at Bolton Abbey by a monsoon-like cloudburst, but the rain held off for the rest of the afternoon. I had not been to this event before and enjoyed all aspects, the gala with its family fun, running the road race and then watching the junior and senior fell races. The senior fell race was started by 94 year old Bob Newbould who won the race in 1939! Some excellent Harrier results below. Sue Morley reports ... I ventured to the lovely Howgills for this race of 8 1/2 miles and 2000 feet of climb. In good clear conditions I had a a good view of the scenery and a personal best. Joanne Williamson, FU17 winner, pictured. And Euan Brennan won the U14 class. 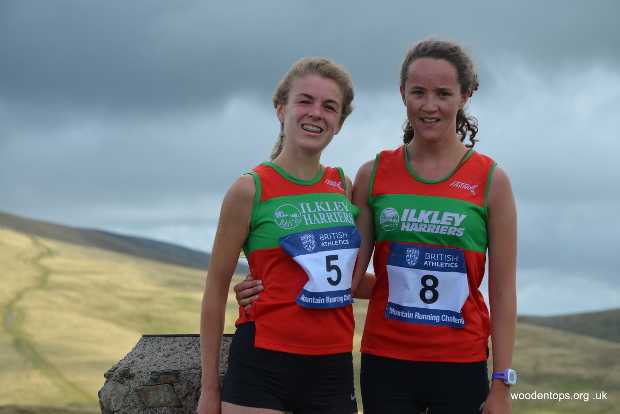 From Dave Woodhead ... Ilkley girls at Sedbergh Winder Hill summit finish of British Uphill's and World Trial today. From Will Buckton ... AM 17km/910m. After battling my way to the Lakes through a stream of incompetent drivers I made it to Seathwaite just before the start of the race. After registering I returned to the car to see the race starting without me! I quickly changed into my fell shoes and pinned my number to my vest and set off in pursuit of the runners. I soon caught the back-markers and managed to pick off a few more to finish 31st out of 89. A great route which takes in the summits of Grey Friar, Swirl How, Brim Fell, Coniston Old Man and Dow Crag. A great low key atmosphere with coffee and cakes at the finish, recommended.